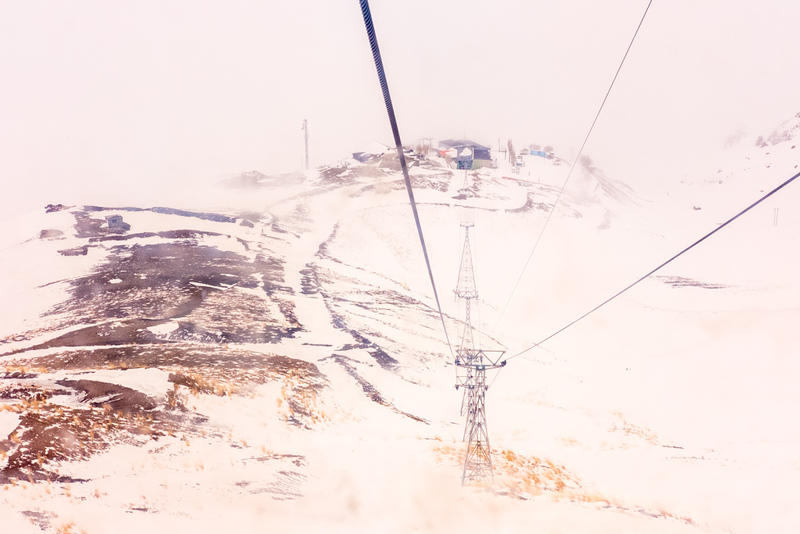 Since we came to Iran during the winter season, we decided to have a look at one of the famous ski resorts in the country — Tochal. Skiing in Iran? Yes, you can do it and no, I’m not kidding 🙂 . There are several great skiing resorts in Iran, including the famous Dizin. 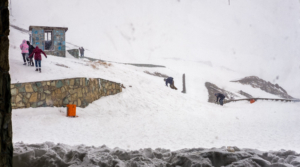 We chose Tochal as it is the most easily accessible mountain to get to. 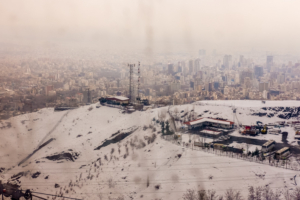 It is also quite cheap to get there as the Tehran Metro runs all the way until Tajrish, which is a mere 10 kilometres away from the Tochal’s gondola lift. Tajrish used to be a village located along the northern edge of the capital city. As Tehran’s population grows, Tajrish was eventually absorbed into Tehran. It is the northernmost neighbourhood of the city, protected by its beautiful guardian, Mt Tochal of the Alborz Range. When the sky is blue and Tehran’s pollution is at the lowest, this mountain range can be seen from the west (e.g. Azadi Square) and the east of the city. Since Tajrish is located at the very end of the capital city, I would expect that the neighbourhood was pretty calm and almost deserted. Boy, was I wrong! As soon as we stepped out of the metro at around 11 am, we were swarmed by people walking from all sorts of directions. It is a busy and bustling neighbourhood with its own old bazaar and commercial centres. A line of beautiful large trees illuminates Valiasr Street, considered as Tehran’s most beautiful road. Formerly known as the Pahvali Street, this 17.9 km road starts from Tajrish all the way to the south of the city. With its gorgeous backdrop of the snowy Tochal and elegant European-inspired low-rise apartments, it is hard to miss this street on your way to Tochal. This street brought me back to Europe. The residential areas of Tajrish resemble Europe in so many ways. A short ride using a shared taxi brought us to the entrance gate of Tochal. 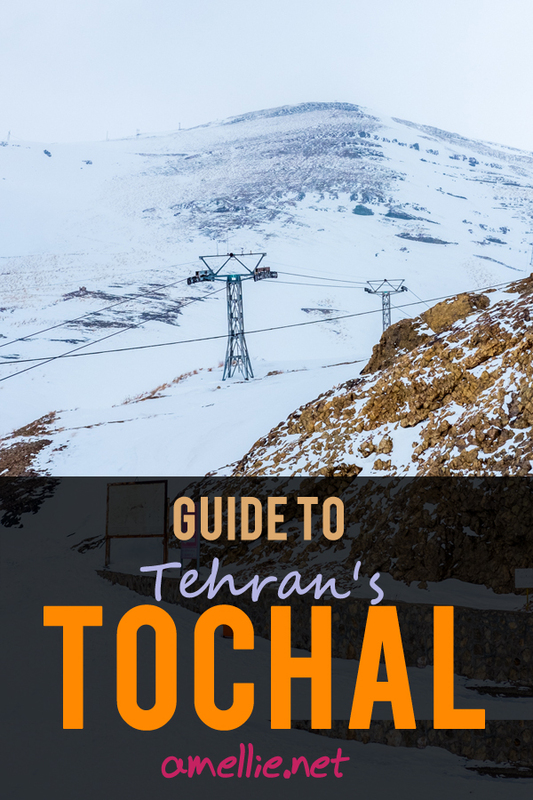 A popular winter gateway for many Iranians here, Tochal is the cheapest and easiest-to-get-to place for skiing. Unfortunately, when were in Tochal, the weather was terrible, so we decided to cancel the ski excursion. My body was not used to the extreme cold weather, so I was completely in shock. I could barely move and as a result, I didn’t take that many pictures when were in the Station 7. We ended up going down to the Station 5 and warming ourselves up at the only restaurant there. My husband and I wanted to come back to Tochal in the last few days of our trip to hike to the summit. However, the weather was not pleasant (again!) as it was raining non-stop. I guess, we were not very lucky and it was probably a sign that we had to visit Iran again in the future! 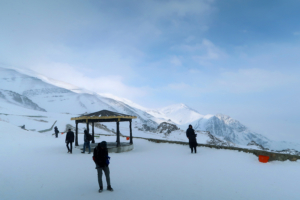 It’s pretty easy to go to Tochal from Tehran, as it is the closest ski resort to the city. The cheapest way to go to Tochal is by taking a combination of a metro and a minivan/shared taxi. First, take a metro line 1 (red line) all the way to Tajrish. This is probably the fastest way to get to Tajrish as Tehran’s traffic can be extremely bad and unpredictable. The cost to take a metro is fixed and it does not depend on the distance, so it is very cheap! Once you arrive in Tajrish, just mention “Tochal” to taxi drivers standing nearby the metro station. They would quote a ridiculously expensive price, so be patient and try to haggle and go to another taxi drivers. I find that cheaper fares are quoted from the moving taxis along the main street. 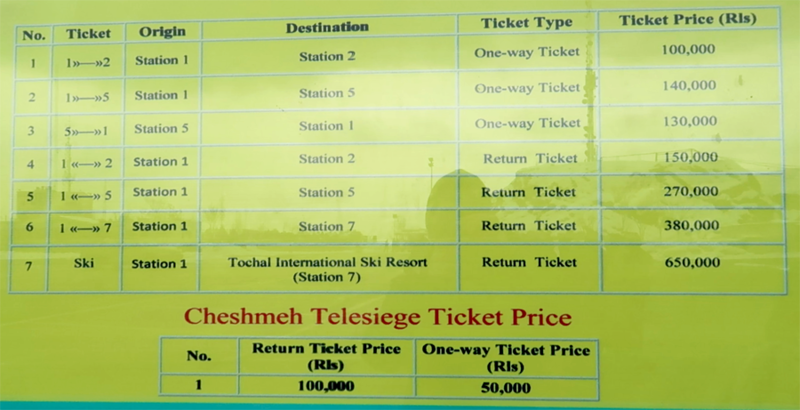 As a reference, we paid 75,000 rials per person to go to Tochal (yes, we didn’t haggle enough!) and 20,000 rials per person to come back to the metro station! 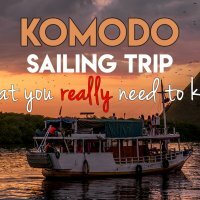 The difference in price is staggering, so be extra careful! You can also try their Uber-like app called Snapped as it is probably cheaper. The journey from the Tochal metro station takes about 30 minutes, depending on the traffic. Tajrish is a busy area and it gets really crowded during rush hours. If the sky is clear, you will be able to see Tochal from the beautiful neighbourhood of Tajrish. You will be dropped off at the beginning of Velenjak Valley, which is one of the entrances to Tochal. This exact same spot is the place to get taxis or shared taxis when you want to go back to the metro station. 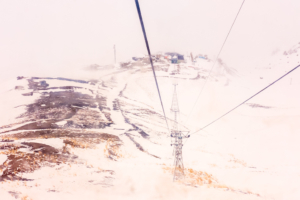 From the gate, you can either take a minibus for 20,000 rials return or walk for 30 minutes (about 2.2 km) up to the Station 1 of the gondola lift, known locally as the Tochal Telecabin. The first station features some facilities such as restaurants, toilets, and a prayer room. 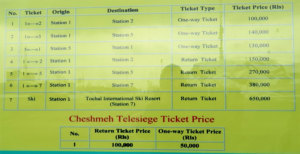 The ticket counter is also located in this station, where you can purchase the tickets for the telecabin ride. While the telecabins are capable of transporting visitors to the last Station 7 at 3,740 meters in no time, those with extra stamina can try combining hiking to one of the stations and riding the telecabin. Those seeking for more challenges and experiences can opt to hike all the way to the top. Shelters are built along the hiking trails, making it easy for hikers to stop and take a rest when needed. Choose the destination station wisely! If you are planning to go for skiing, then your only choice is to purchase the ski ticket to Station 7, costing 650,000 rials return. 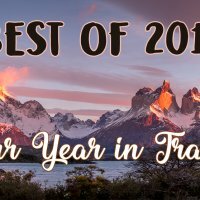 But if skiing is not your cup of tea or the ski season is off, then you need to decide to which station you are going to based on the weather on that day. 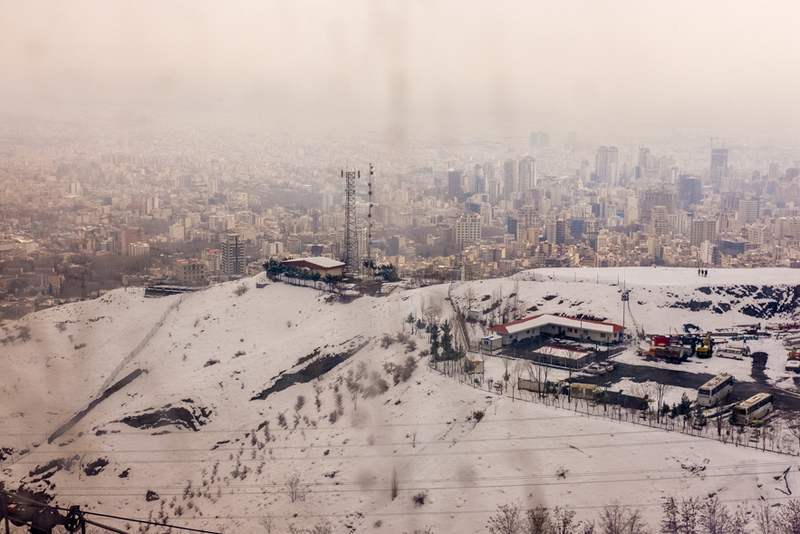 If the weather is clear and nice, then going all the way to the last station may be worth the ride as you will be able to see the surrounding mountains and the city of Tehran. From the Station 7, you can also hike for a bit to the summit of Mt Tochal. However, I wouldn’t recommend you to do it if the weather is not good or if the visibility is low as you can’t see much. Station 1 – 1900 meters. There are plenty of restaurants, washrooms, and a prayer room. Station 5 – 2935 meters. There are a restaurant and a rescue centre. Station 7 – 3740 meters. The last station of the gondola lift, located 30 minutes walk from the main peak of Tochal. You can take a chairlift to Chesmeh from here. If you aren’t hiking, you will probably back to Tajrish by 4 PM. Once you are here, you can explore many things around the neighbourhood, from the bazaar to the palace. My Iranian host recommended me to go to this traditional bazaar. The bazaar itself is much smaller than the one in the center of the city, the Grand Bazaar. It is much less crowded than the Grand Bazaar, which is something I prefer. I am not sure if there is a difference in terms of prices between Tajrish and Grand Bazaar, but we ended up doing most of our shopping here. We bought some figs, nuts, scarves, and some souvenirs. 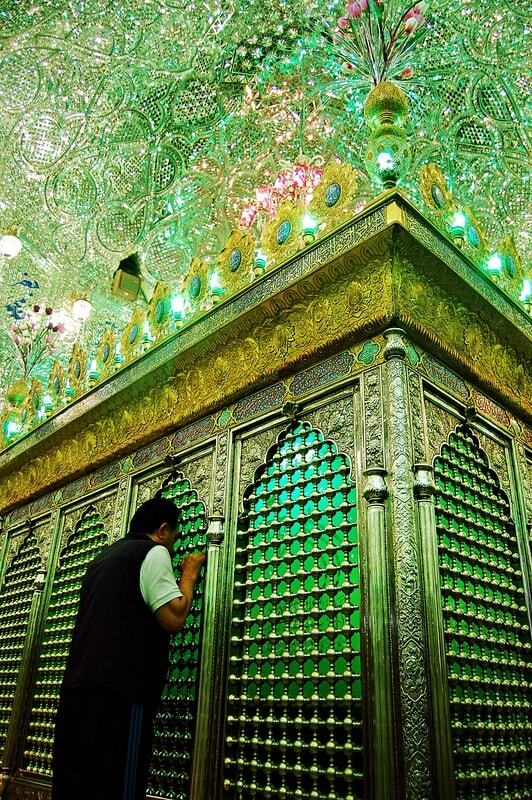 Imamzadeh Saleh Mausoleum is a mosque which encloses the tomb of Saleh, a son of the Twelver Shia Imam, Musa al-Kadhim. 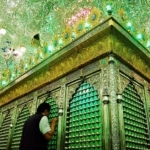 It is one of the most popular Shia shrines in northern Tehran. We did not get to visit this mausoleum as we had to meet our CouchSurfing host for dinner. I think it would be an interesting visit to see and understand Shia’s perspectives on their imams and Holy Shrines. Hi! I might be visiting Iran in early may and after reading your blog, I am very interested in visiting Tochal. I was wondering whether if you purchase a ticket up to the last station, is it possible to actually stop at every station? or it will directly transports you to the last station? Hi I’m writting a book in english about TOCHAL . I’m iranian and live in Tehran. give me your suggestion and idea.